You might know that we are going through a kitchen renovation. My husband reminds me daily that we will never do this again. Oh yes. You will see a “for sale” sign planted in our front yard before you see another dumpster in our driveway. But, right now there is no turning back. And when you redo a kitchen, well, you have the dilemma of what to do with your old appliances. Some of them might actually be in pretty good condition after all. The easiest thing, of course, is to throw them in the dumpster – and believe me, I was tempted. Except for the little problem of there not being enough room in the dumpster for our big old refrigerator. And by big, I mean the biggest GE Profile fridge ever made. I do not exaggerate. We had this monster in our garage for much of January. We tried to get the word out that there was a refrigerator in good working condition up for grabs. 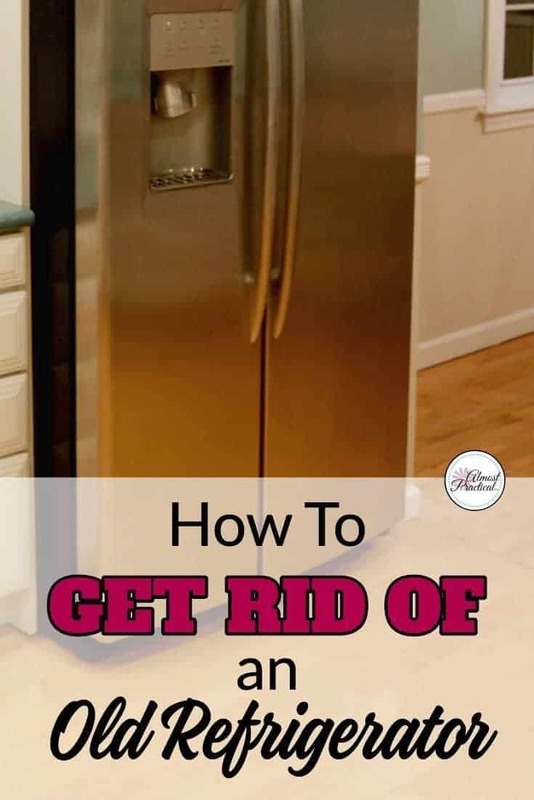 Finally, I did a Google search for how to get rid of a refrigerator and found a really simple solution. The Salvation Army takes refrigerator donations, and they will pick it up too! But note that the refrigerator must be in good working condition. All you do is fill out an online form. Tip: On the Salvation Army website, click the Donate button in the upper right hand corner, enter your zip code in the form that drops down, and then find your item (in this case a refrigerator) on the list of types of goods that you want to donate that opens up next. They show up with their truck, plug in your fridge to make sure it works, load it onto their truck, and away it goes. You also get a tax deduction to boot. I felt good knowing that I wasn't tossing a very useful item into the trash – the world has enough of that already. If you are undergoing a kitchen renovation and are wondering how to get rid of a refrigerator – check out the Salvation Army website here. Chances are that you are probably in their service area. I was surprised to find out that they service my neighborhood, because we don't have a Salvation Army drop off location nearby. If you have another suggestion on how to get rid of a refrigerator or other kitchen appliances, do let us know in the comments below. I think many people throw out perfectly usable large appliances because they don't really know what else to do with them when they upgrade. I probably would have done the same for convenience. But since we are renovating the kitchen, the old appliances went out the door long ago, and the new ones have not yet arrived. 6 weeks with no kitchen. I am going nuts!